Emmett: "I was right ... even though I didn't want to be." And most importantly, the doctor says everything is looking good. We even caught a glimpse of her sucking her thumb during the ultrasound. 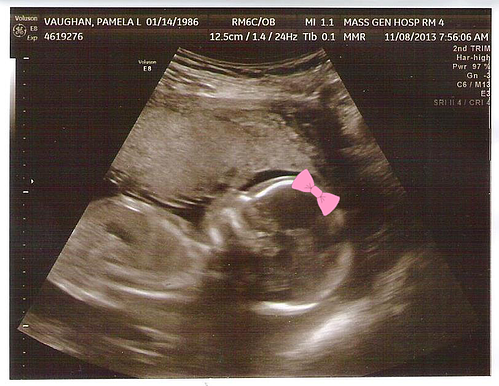 We also have a new due date now -- April 10th. We're all very excited that we're going to have a little girl in the family -- only five more months until I'm no longer outnumbered. Let the nursery planning and name-picking commence! YAYAYAYAY!!! Little bebita lump :-) Congratulations! I can't wait to buy your baby girl all of the tutus. Yaaaaaay! You're due on my birthday! 4/10/14 sounds like a sweet birthday!